Don’t upload articles or content that encourage violence or crime. It's important to keep in mind that not everything that's mean or insulting is hate speech, or it may be a major headline from a reputable publication that you want to ‘Call Bull’ on. That said, the line between unintentional and serious attacks is something we take seriously and will review and delete accordingly if need be. You should not post content that is intended to incite others to commit violence, mocks victims of violence, or includes a direct and specific threat of violence to others. LCB is about original content and sharing, it is also about respecting other people’s ideas and opinions so if there are two or more posts that are very similar (or identical) it is at the discretion of Admin to remove the newer posts so the original poster does not lose their votes. No posts that violate LCB's Terms of Service. Considering these tips when sharing with the ‘Callers’ in the LCB community will help ensure you're contributing great content and people comment and vote on it. Good sharing means posting content that is interesting or a hot topic. Effectively content which opens up a discussion, shares something new and unique, or has a deeper story to tell beyond the headline itself. Ask yourself first: is this something I would be interested in seeing on LCB if someone else posted it? LCB expects that when you post something that you will be explicit about it and how you are connected to the content you’re posting. After all it is all about ‘getting to the truth’ so trying to hide that relationship, or not explaining it well to others, is classed as bad sharing. Good sharing means knowing when the LCB community has spoken through the Lets Call Bull rating slider and upvotes or downvotes and respecting that. That’s the point, get your message or questions out there and then ask others to have their view and say on it. You should be tolerant of other people’s views of your posts as we are all different. If you aren't sure if your post fits the rules, please don't post it. If you've seen a rule-breaking image posted somewhere else on LCB it doesn't mean it's okay for do the same (and if you have seen a rule breaking post please report it, thanks). The servers and site reviewing software we use logs information about each computer connecting with our site such as IP address, dates and times of each login, device characteristics, operating system, browser type, type of connection, page and image viewing statistics, and incoming and outgoing links. We associate this information with comments you post or votes you enter. We also log the metadata associated with any images or videos you upload. None of this automatically collected technical information is associated with any identified person at the time it is collected, but it could be associated with you under two circumstances: First, if you choose to give us personal data about you as described below, the technical information we collect that would otherwise be anonymous could instead be logged as coming from you; and second, if we are required to disclose our server logs as a result of a subpoena or other legal process, some third party such as your internet provider could match our anonymous technical information with you, using information beyond what is found on our servers. We only collect whatever personal data about you that you choose to give us, such as a contact email address and profile information. If you open an account you do not have to use your real name – you may choose a username and email address that reveal nothing about your identity. If you give us an email address, we may send you promotional messages once in a while but we won’t sell them or pass them on to third parties for advertising or profit (oh and of course you’ll be able to opt out of direct mail at any time). Because LCB neither requires nor requests personally-identifiable information about you, if you choose to remain anonymous LCB will not disclose to any third party any personally identifiable information about you. The only exception is if we receive a subpoena or other legal process requiring us to disclose whatever information we may have about you, we may have no choice but to do so. You may correct, amend, or delete inaccurate private data (if any) you have given us. For legal reasons we may retain backup and/or archival copies of information prior to your corrections, amendments, or deletions. We take every reasonable precaution to protect your private data from loss, misuse, unauthorized access, disclosure, alteration, or destruction. You are responsible for taking every reasonable precaution on your end to protect any unauthorized person from accessing your LCB account. By uploading a file or other content or by making a comment, you represent and warrant to us that (1) doing so does not violate or infringe anyone else's rights; and (2) you have sufficient intellectual property rights to upload the material consistent with these terms. With regard to any file or content you upload to our site, you grant LCB a non-exclusive, royalty-free, perpetual, irrevocable worldwide license (with sublicense and assignment rights) to use, to display online and in any present or future media, to create derivative works of, to allow downloads of, and/or distribute any such file or content. To the extent that you delete any such file or content from the public portions of our site, the license you grant to LCB pursuant to the preceding sentence will automatically terminate, but will not be revoked with respect to any file or content LCB has already copied and sublicensed or designated for sublicense. Also, of course, anything you post to a public portion of our site may be used by the public pursuant to the following paragraph even after you delete it. You may use UGC for anything that qualifies as fair use under copyright law, for example journalism (news, comment, criticism, etc. ), but please include an attribute ("Lets Call Bull" or "courtesy of Lets Call Bull") next to where it is displayed. Please send all information to. 1. LCB’s trademarks. 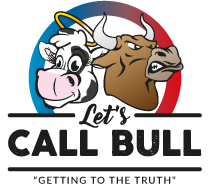 Our trademarks include the phrase ‘Lets Call Bull’ and the distinctive logos. a. Casual reference. You can refer to Lets Call Bull by name in the text of something you post: blog thread or entry, comment, article, etc. You can add a screenshot of an LCB page (or something that’s identifiable as part of an LCB page) – or even one of our logos – to your blog entry, comment, article, etc., as long as it’s clear that the screenshot or logo is part of what you’re commenting about and isn’t used as a header, avatar, or label. And of course you can refer to LCB users as Callers! c. Non-commercial “useful reference.” If you’re doing something interesting or useful, yet non-commercial (no goods or services advertised or offered for sale, no membership fees, no solicitations for money) involving LCB or Callers, you can use the words LCB or CALLERS to describe what you are doing, even as a header or label – “An online forum for Callers” etc. – without first obtaining our permission as long as you observe three simple rules: First, don’t use any of our marks as part of a domain name. Second, don’t use any of our logos. (That would require our permission.) And third, post the disclaimer “NOT AFFILIATED WITH OR APPROVED BY LCB” prominently enough and in a sufficient number of places that nobody will be under the impression that your project is produced or approved by LCB. By the way, we still highly recommend that you let us know about any such project, preferably while it’s in the planning stage – we can make sure you don’t accidentally do something that would require our permission, we can grant permission in most cases when needed, and we may be able to offer helpful suggestions and ideas. a. Using any of our logos as part of a non-commercial “practical reference” (as described above). b. Using any of our marks as part of a “practical reference” in a commercial context (goods or services advertised or offered for sale, membership fees, solicitations for money, etc.). c. Using any of our marks as (or in) a header, label, or avatar. d. Using any of our marks as part of a product name or logo. e. Using any of our word marks as part of a domain name. f. Using any of our marks in a way that might imply sponsorship, approval, or affiliation. 6. If these policies don’t cover everything, that doesn’t mean we waive our legal rights. If nothing in these policies covers your specific situation, we still reserve the right to protect our trademarks and copyrights. And even if you are using one or more of our trademarks or copyrights in a way that does not require you to first get our permission, we reserve the right to tell you to stop using them if, in our view, your use of them would jeopardize our trademark or copyright rights, dilute our trademarks, or violate the posting prohibitions described in our terms of service – which we also apply to the use of our marks. If you’d like to reproduce or make a derivative work of any of our logos as (or as part of) a work of art for commercial purposes – anything from a phone case or T-shirt to the hotly anticipated boxer shorts – that will never constitute “fair use,” so you’ll need our permission in the form of a license. If you have any doubts as to what constitutes “fair use,” or if you would like to request a license, please contact us at licensing@LCB.com. What if my copyrighted work was posted on LCB without my permission? It is against our terms of service for users to upload copyrighted material, but if you come across your work on our site, please submit a completed DMCA complaint to abuse@LetsCallBull.com to have your image or story removed. The DMCA notice of takedown is required by law. We do take this very seriously and review each and every request but if you do not submit a completed notice, your image may not be removed. Please do not use our ‘Report Image’form to make DMCA complaints as this form is intended for images against our Terms of Service. If you notice content that breaks the Posting Rules such as an explicit comment, an abusive post, or something else that doesn't seem right please report it. We try to monitor posts, and enjoy using the site ourselves, but we rely on ‘Callers' to find content that isn't allowed, so please help us out by reporting anything so we can keep the site safe and usable by everyone. All reports are reviewed by our human Site Administrators on a first come first served basis (and acted on accordingly) but please remember only signed in users can report content so sign up and get involved. What happens to reported content? 1. Ignore the report. Nothing happens and the post is not removed. 2. Agree, the post is against the rules. A warning message is then sent to the user from the LCB system and the post is removed from the site. 3. Mark the post as spam. The post is deleted, but a message is not sent. This action is reserved for spambots and advertisers. The purpose of the warning system is to alert people of the rules and give users a chance to participate and contribute to the overall ‘Bull’ ratings and experience. If multiple submissions from a single user break the rules they will be banned and their account terminated. Although of course we strive to make LCB as dependable as possible, LCB's services are provided on an AS IS – WITH ALL FAULTS basis. Your use of our service is entirely at your own risk. We do not guarantee the availability of our service at any given time, or the reliability of our service when it is running. We do not guarantee the integrity of, or the continued availability of, files on our servers. Whether we make backups, and if so, whether restoration of those backups will be available to you, is at our discretion. LCB DISCLAIMS ALL WARRANTIES, EXPRESS AND IMPLIED, INCLUDING WITHOUT LIMITATION IMPLIED WARRANTIES OF FITNESS AND MERCHANTABILITY. NOTWITHSTANDING ANYTHING ELSE STATED IN THESE TERMS, AND IRRESPECTIVE OF WHETHER LCB TAKES OR DOES NOT TAKE MEASURES TO REMOVE INAPPROPRIATE OR HARMFUL CONTENT FROM ITS SITE, LCB HAS NO DUTY TO MONITOR ANY CONTENT ON ITS SITE. LCB DOES NOT ASSUME RESPONSIBILITY FOR THE ACCURACY, APPROPRIATENESS, OR HARMLESSNESS OF ANY CONTENT APPEARING ON LCB.COM THAT IS NOT PRODUCED BY LCB, INCLUDING BUT NOT LIMITED TO USER CONTENT, ADVERTISING CONTENT, OR OTHERWISE. Your sole remedy for the loss of any services and/or of any images or other data you may have stored on LCB's service is to discontinue your use of our service. LCB WILL NOT BE LIABLE FOR ANY DIRECT, INDIRECT, INCIDENTAL, SPECIAL, CONSEQUENTIAL, OR PUNITIVE DAMAGES ARISING OUT OF YOUR USE OF, OR INABILITY TO USE, LCB'S SERVICES, EVEN IF LCB HAS BEEN ADVISED OF OR REASONABLY SHOULD HAVE KNOWN OF THE POSSIBILITY OF SUCH DAMAGES. NO CAUSE OF ACTION ARISING OUT OF YOUR USE OF LCB'S SERVICES MAY BE BROUGHT MORE THAN ONE YEAR AFTER IT OCCURS. YOU WILL INDEMNIFY AND HOLD LCB AND ALL OF ITS PERSONNEL HARMLESS FROM ALL LOSS, LIABILITY, CLAIMS, DAMAGES AND EXPENSES, INCLUDING REASONABLE ATTORNEY FEES, ARISING OUT OF OR RELATED TO YOUR VIOLATION OF THESE TERMS, YOUR INFRINGEMENT OF ANY THIRD PARTY'S RIGHTS, AND ANY HARM CAUSED TO ANY THIRD PARTY AS A RESULT OF YOUR UPLOADING OF FILES, COMMENTS, OR ANYTHING ELSE TO OUR SERVERS.